Director/Photography – Roel Reiné, Screenplay – Brendan Cowles & Shane Kuhn, Story – Randall McCormick, Producer – Leslie Belzberg, Music – Trevor Morris, Visual Effects Supervisor – Gary Oldroyd, Visual Effects – Beach VFX (Supervisor – Gary E. Beach), Celluloid Visual Effects (Supervisor – Holger Hummel) & Terminal FX (Supervisor – Anton Mitrakhov), Special Effects Supervisor – Kevin Chisnall, Makeup Effects – Kittichon ‘Q’ Kunratchol, Production Design – Patrix “Pae” Meesaiyaat & Kuladee “Gai” Suchatanun. Production Company – Universal 1440 Entertainment/Alphaville/Stephen Sommers/Misher Films. Mathayus the Akkadian, the former Scorpion King, has lost his kingdom and now works as a mercenary. He is hired by King Horus who at war with his brother Talus who seeks to unseat him. Horus requires Mathayus to go to the kingdom of King Ramusan and prevent Talus from invading to capture the Book of the Dead with which he will be able to raise mighty warrior spirits. Mathayus is paired with the filthy and brutish Olaf, another mercenary from Germania. By cleverness and trickery, they drive Talus’s armies away after they penetrate the walls of Ramusan’s city. Ramusan has no money to pay them but offers Mathayus the hand of his daughter Silda if he will rescue her from capture by Talus. As they head off to save the princess, Mathayus and Olaf are caught between different sides – their paymaster Horus, rescuing the princess for Ramusan, Talus who also seeks to hire them, and an army of mysterious ninja warriors who abduct Silda. The Scorpion King 3: Battle for Redemption was the fourth of the Scorpion King films. The series initially began with The Mummy Returns (2001) where The Rock (back before he began to bill himself as the more mundane Dwayne Johnson) appeared as The Scorpion King who was a minor villain. The Rock so impressed the producers that they quickly spun him off in his own film with The Scorpion King (2002), a lightweight and eminently forgettable fantasy film where his character merely became a standard barbarian hero. This spawned a direct-to-dvd sequel with The Scorpion King: Rise of a Warrior (2008) with The Rock’s role being inherited by Michael Copon and the show being pushed into the absurd by Russell Mulcahy’s unserious direction. With The Scorpion King 3: Battle for Redemption, Mummy series director Stephen Sommers is still present in a producing capacity, while direction has been turned over to Roel Reiné. Reiné began making films with an action bent in the Netherlands and entered genre material with his third effort Drifter (2008), going onto the other genre likes of Deadwater (2008), The Lost Tribe (2010) and Dead in Tombstone (2013), before gaining a higher profile with another franchise spinoff Death Race 2 (2010) and its sequel Death Race 3: Inferno (2012), as well as other sequels like The Condemned 2 (2015), The Man with the Iron Fists 2 (2015) and Hard Target 2 (2016). You sit down to watch The Scorpion King 3: Battle for Redemption expecting no more than disposable fantasy material – and are largely proven right. The first half-hour or more grates badly. Canadian tae kwon do champion Victor Webster does reasonably well in the title role. He has an undeniable presence and treats the role seriously – for the most part. Unfortunately, the script is determined to outfit him with a series of grating Schwarzenegger-esque one-liners. Webster and Bostin Christopher are paired as an action buddy duo who are constantly trading insults and banter. Whenever the two of them are together in the early scenes, everything is constantly underscored by an irritating barrage of quips and jarring modern colloquialisms – “make mine medium rare,” “crime doesn’t pay”. The other major minus of the film is Billy Zane who is in characteristic over-acting mode and gives a thoroughly awful, campy performance where he plays to the gallery and takes none of the show seriously at all. Where The Scorpion King 3: Battle for Redemption does work well is when Roel Reiné gets to the action. The film is especially good when it comes to the scenes of dozens of black-clad ninjas leaping around in combat. We get some decent battle scenes – the lower cost of location shooting in Thailand allows the employment of plentiful extras, meaning that these scenes have the authenticity of real people on a battlefield rather than visions of CGI massed extras that have dominated historical films of recent years – see Alexander (2004), Troy (2004) and Kingdom of Heaven (2005). The other benefit from the Thai shooting is in its being able to use some of the Khmer temples as locations, while the battle scenes are even able to wind elephants in as part of the action. It is these aspects that make Battle for Redemption the best of the Scorpion King films so far – even if the substandard and hackneyed plotting never allows it to rise to anything more than a strictly average effort overall. 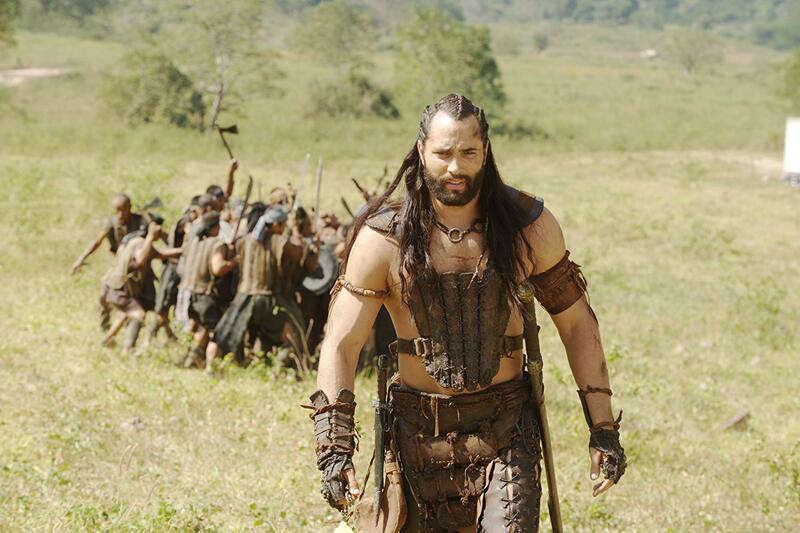 Victor Webster returned to the series in the subsequent The Scorpion King 4: Quest for Power/The Scorpion King: The Lost Throne (2015), after which Zach McGowan inherited the role for Scorpion King: Book of Souls (2018).